Acrylic Lecterns are our best selling products. All our lecterns are made in-house at our factory in Warwickshire. The lectern designs incorporate both modern styling with excellent value. Our Lecterns are constructed using the finest acrylic materials to add strength and stability without the use of screws and other fixing which we believe detract from the overall appearance. Some designs equipped with a removable front panel, which can incorporate a logo can be made from any number of materials, including clear, frost, coloured acrylic, and aluminium. All our Wood Lecterns are well crafted in a variety of real wood and veneered panels including finishes in white oak, beech, maple, and walnut. All our lectern designs maintain an optimum balance between longevity, quality and cost. All can be customised with a custom logo added or left plain. Most of our wooden lecterns are available from stock however, the large specialist pulpits, plinths and podiums are produced by traditional wood working techniques and are made specially to order. Our composite Lecterns combine the timeless appeal of traditional wood finishes with contemporary materials to stunning effect. All provide the optimum balance between longevity, quality and cost. All composite lecterns can be customised with a custom logo or left plain. Most of our composite lecterns are available from stock however, adding your logo or commissioning a bespoke design are made specially to order. Discriminating customers� with demanding purchasing attitudes based on personal beliefs and taste for finer things in life will delight in our Premium Lectern selection. Our experience in offering our Premium Lecterns to discerning clientele has been repeat business, as well as a high levels of word-of-mouth referrals. Our Specialist Lecterns are designed to meet specific needs whether that be the presenters height, as in young persons or environmental where storage of a lectern when not in use would be a concern. All provide the optimum balance between longevity, quality and cost. 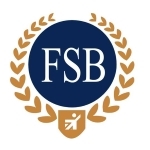 Most of our Specialist Lecterns are available from stock however, adding your logo or commissioning a bespoke design are made specially to order. We always have a stock of lecterns that are classed as refurbished, second user, old-new stock, 'B' Grade, prototypes, etc. It is always worth giving our sales line a call to see what bargains we have available as we don't always list all these Lecterns on the website as they are often 'one-offs' and are sold very quickly. Commissioning Nova Lecterns to undertake Custom Work is an inexpensive way to personalise and adapt one of our standard Lecterns to meet specific needs. For example we can add castors to aid in transport, cable management to keep speakers area safe and tidy, provide personalised lighting to illuminate notes, noise cancelling microphone mounts to add clarity and reduce noise and inset a perfectly fitting inset mount for any tablet device. 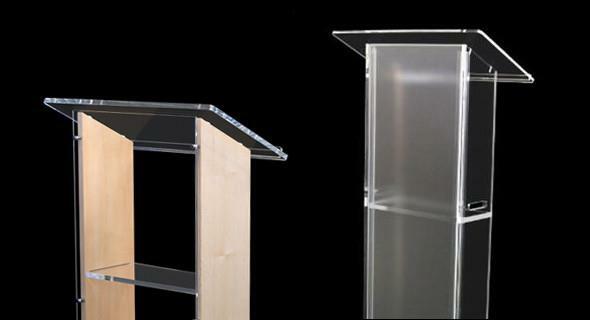 We can even accommodate any colour change from the standard Clear Perspex used in most of our Lecterns. The sale of our fist Lectern was to a church. In fact the businesses grew, mainly by 'word of mouth' recommendations between the many churches. We have developed a range of Pulpits ideally suited to meet all budgets and easily adapted for use in every church. From the portable fold flat Topaz model ideal for the mobile Preacher to the imposing solid wood Sovereign model designed to be a permanent fixture in any church. At Nova Lecterns we enjoy nothing more than a good challenge which is why we have built up a reputation for specialising in making one off designs as well as standard products. Our background in design and prototyping means we have all the expertise required to produce very high quality one off designs without breaking the bank. Simply tell us the style and finish you would like and the equipment you wish to install in your lectern, and we will produce concept design drawings for your approval. 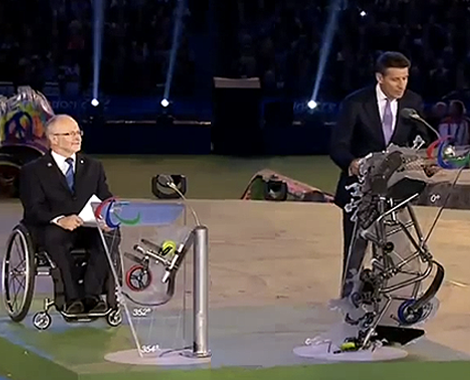 Nova Lecterns commissioned to manufacture a pair of bespoke lecterns for the opening and closing ceremonies. The sculptures on the speech lecterns that were created by the disabled artist Tony Heaton, himself a former wheelchair basketball international and now chief executive of the disability arts organisation Shape - they were formed from parts of sports wheelchairs and running blades mounted by Nova on a lectern made from 25mm clear acrylic sheet . 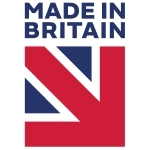 All our products are made by us in our Warwickshire factory. We are confident that our lecterns will provide a lifetime of service. Made by us in our Warwickshire factory.